MIDI Polysher, MIDI Plug-in from eaReckon. Both eaReckon MIDI Polysher and Ferret 4x4 v1.1 sport a new GUI and are now available in 32 and 64-bit VST format for Mac OS X and Windows. The plug-ins were initially developed for BloXpander but you can now use them in you DAW. 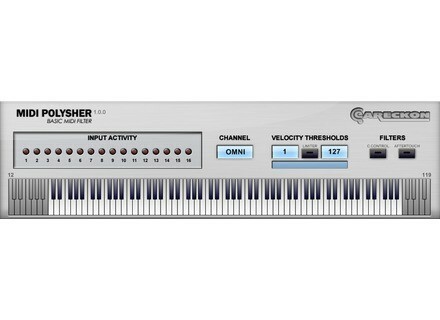 MIDI Polysher is a MIDI filter that will split your keyboard controller into several velocity and note zones in order to control multiple instruments from a single device. The plug-in offers global CC, aftertouch and pitch bend filtering, filter per MIDI channel and a transpose option. Ferret 4x4 will link multiple channels or tracks within your projects thanks to three pairs of inputs and three pair of outputs, while input and output 1 are direct links. The plug-in supports sidechain operation and eaReckon adds that the 4 inputs are processed and mixed before being sent to the 4 outputs. You can then use it to create extra aux returns, mix various signal before sending them to an effect bus, create specific mixes for headphone monitoring and more. Note that along with the VST format, Ferret 4x4 is also available as an AU plug-in for Mac OS X. Both plug-ins are available for free download from www.eareckon.com. [NAMM][VIDEO] WaveDNA Liquid Rhythm Here is a demo of version 1.3 of the Liquid Rhythm beat generator at the WaveDNA booth at Winter NAMM Show 2014. Audiomeals releases Talkie Box Audiomeals has introduced Talkie Box, a new standalone sound design audio tool to emulate Radio, Walkie Talkie and Telephone effects on Mac and PC. [NAMM] New Akai MPK MIDI keyboards Akai adds to its MPK keyboard controller range three new models that were introduced at NAMM 2014.